There is growing consensus in the buildings industry that focusing on building systems—a combination of equipment, controls, operations and interconnections—will become increasingly necessary to achieve future meaningful and cost-effective energy savings in buildings. 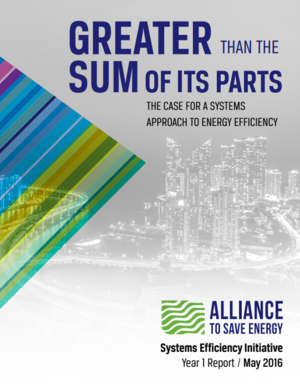 The Alliance to Save Energy and its partners released the Systems Efficiency Initiative (SEI) Year 1 Report at the 2016 EE Global Forum in Washington, D.C. The report, entitled Greater than the Sum of its Parts: The Case for a Systems Approach to Energy Efficiency (Sum of its Parts), describes a major shift in traditional thinking about buildings efficiency that has been heralded as a game changer by industry partners. Sum of its Parts explores the significant untapped energy savings available through a systems-efficiency approach to building design, construction and operation. The report considers interactions within various building systems, with a focus on mechanical and lighting systems. It also explores interactions among multiple systems within a building, and discusses challenges and opportunities for implementing a systems-level approach to building efficiency. Sum of its Parts is the product of collaboration among more than 50 stakeholders—including manufacturers, designers and builders, electric and natural gas utilities, efficiency advocates, and national and state government agencies—to focus on defining ways to achieve the next level of efficiency in buildings by optimizing building systems. Click here to read the two-pager document with an overview of the Systems Efficiency Initiative. 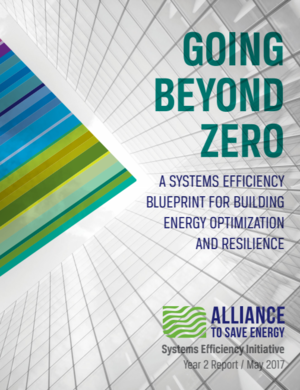 Learn more about the Systems Efficiency Initiative and the new report, Greater than the Sum of its Parts: The Case for a Systems Approach to Energy Efficiency, from Alliance to Save Energy senior vice president of policy & research, Kelly Speakes-Backman.